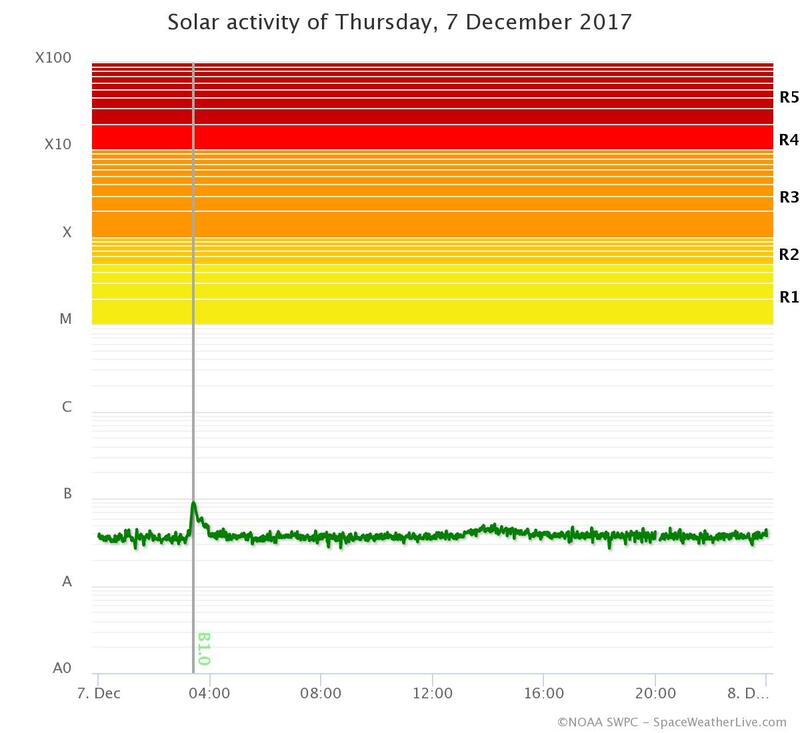 On the Solar activity link for 2017-Jan-16, it lists two B-class flares for the day, a B1.3 @01:44 and a B1.4 @18:23, both of which match SWPCʼs Solar Events page for Jan 16. 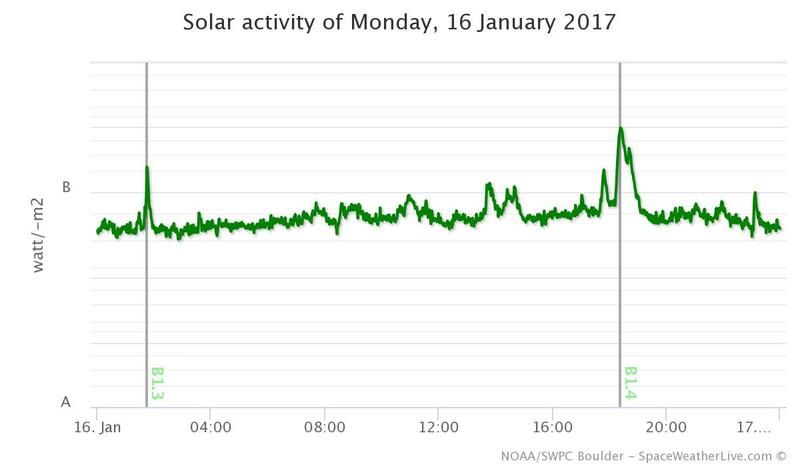 However, while if you hover over 01:44 on that dayʼs flare graph, it shows B1.31, when you hover over 18:23, it gives a B1.99, both of which match the values for the time slots on the 1-minute X-ray flux text page for Jan 16! When you look at the graph, it is obvious that B1.99 is the correct value: Why the discrepancy? Looks like you caught NOAA on a mistake . It isn't the first time NOAA classifies flares with faulty strength, we've done multiple corrections in the past for the M1+ solar flares where there was difference in the GOES data and the SWPC logs and those where corrected by us in our databases to make sure we have the correct values. We have now edited the flare so it will display correctly, thx for reporting! On a related note, why do they tend to round flare/flux levels down—e.g., “C3.28” ➜ “C3.2”, “X1.79” ➜ “X1.7” ➜ “X1”—rather than to the nearest (in these examples, it should be “C3.3” and “X1.8” ➜ “X2”)? This doesnʼt seem to be an occasional error, but intended policy: Is there a valid reason for this? 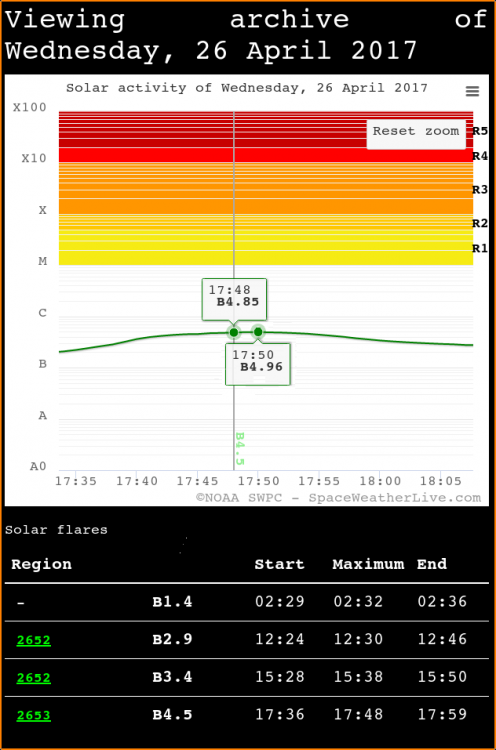 Is there a reason that the largest flare of the day is maxed as B4.5 at 17:48 (rather than B4.9 or B4.8, as the chart shows it should be at that time? ), and not B5.0 or B4.9 at 17:50 as appears to be the case? Or is this another “NOAA mistake”? ? ? PS. : that screenshot looks like our site, but yet the color scheme is different ?? Thatʼs because it is your site ?—I took three screenshots and combined the relevant parts into one concise shot (flipping the bottom line of the 17:50 flare bubble)! ? As for the color scheme, yes, I use the inverse white on black. as it is easier on the eyes. ? BTW, by including the full flare spectrum up to the unthinkable X100, you eliminated the “Reset Zoom” getting in the way of the flare bubbles! ? A suggestion: Why not add dim colors to the C, B and A chart ranges, too—say, something like light aqua blue (#8FFFFF) for Cs, light lime green (#B0FF50) for Bs and light gray (#D2D2D2) for As—or, at the very least, darken the B and C boundary lines? ? Is there a reason that the largest flare of the day is maxed as B4.5 at 17:48 (rather than B4.9 or B4.8, as the chart shows it should be at that time? ), and not B5.0 or B4.9 at 17:50 as appears to be the case? 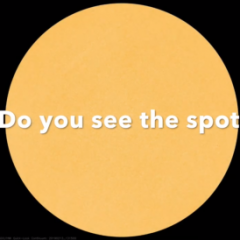 Or is this another “NOAA mistake”? I looked at the events file of April 26 and it is not a mistake. The thing is, for some reason they took the peak value as measured by GOES 13 for that event, instead of GOES 15. The X-ray data in the archive is only the data from the primary satellite which is GOES 15 right now. Why they took the data from GOES 13 while GOES 15 was up and running at the time of the event is a mystery for me. We've seen this before too and don't really understand why NOAA suddenly uses secondary data instead of their primary source. Normally if there are troubles with primary data, it is announced that they would switch to secondary but when solar flare strengths are added we'll get situations like this. Sometimes NOAA isn't really correct . Well, canʼt you just allow the tags that are used above (I donʼt mean total source code, just the ones to be able to manually do the functions above: The automatic WYSIWYG posting can be difficult to edit/delete...such as when I pasted the solar flare quote below the image above a second time and then tried to delete it—the contents deleted, but not the table it posted it in, itself)? BTW, how come no archives for the past two days—is that your doing or NOAAʼs (I know their ftp server seems to be down)? In the software we use html-tag limitation is not available, the creator found that the most users have enough with a WYSIWYG editor. So out of safety, we don't enable it by default. Archive of the last few days is available. Due note that after midnight not all options are available but are added during the night when NOAA updates their stuff. Okay, it is there now (did you just do something, or was it only coincidence? P=). You had it right al along I just overlooked it 😱. We've added the missing data last night (UTC+1) so the archive is complete again. Well, SWPC appears at it again: For the past three days they have been graphing GOES‐15 data, but quoting GOES‐14 flare values (yesterday—Fri.25th—they listed the peak flare as B1.2 @ 2222z, which was GOES‐14...GOES‐15 peaked then at A7.1, as your moving “bubble cloud” tracer graph properly listed—though the blackline flare data is GOES‐14ʼs B1.2!